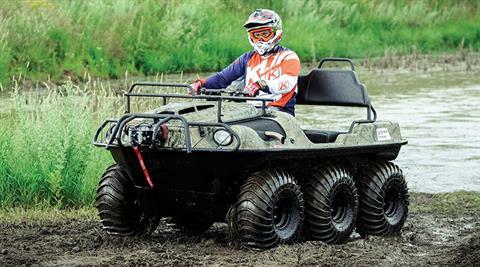 6-WHEELED XTREME-TERRAIN PERFORMANCE FOR EVERYONE! With significant updates for 2018, the Argo Frontier Series models look to continue to build on the strong heritage that has helped them to become Argo’s bestselling amphibious six-wheeler in company history. Offering incredible versatility and value, the revamped Argo 6×6 Frontier models make off-road riding approachable, easy and fun. ENGINE: Dependable ECH air-cooled Kohler gas engines features electronic fuel injection (EFI) to deliver sure starts in any climate conditions, including high altitudes. 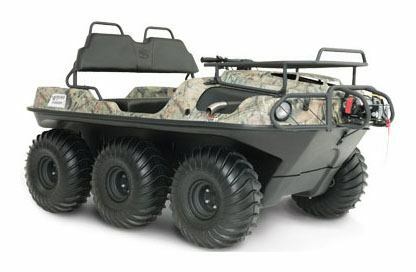 HIGH DENSITY POLYETHYLENE (HDPE) ALL-TERRAIN BODY: Both Argo’s lower and upper body are manufactured using a high density polyethylene material that’s engineered to keep water hazards out and environmental hazards in. 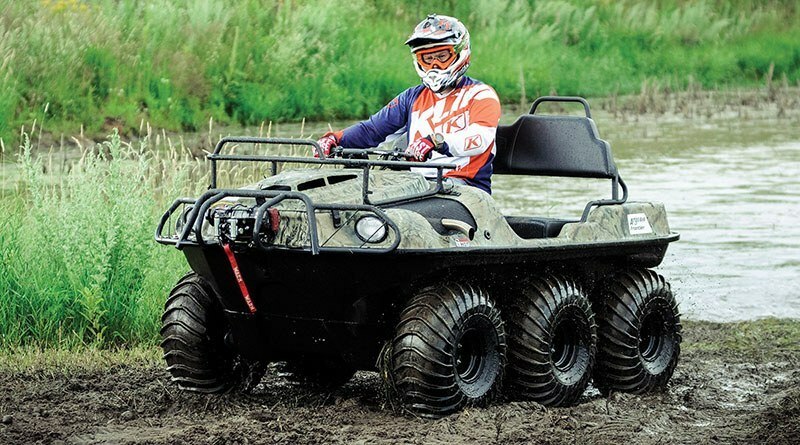 The smooth, durable underbody floats over potential snags, stumps whether you’re forging through the mud, skimming over snow or scrambling over hard rock. TRANSMISSION OPTIONS: Argo’s parent company, Ontario Drive & Gear Limited, is a world leader in precision gearing and high performance transmissions. At the heart of every ARGO is a fully mechanical drivetrain based on ODG technology to ensure the best reliability, maintainability and smooth, efficient transfer of power to the ground. Frontier models feature the ‘Classic’ or ‘Admiral’, including Standard (STD) on the Limited models to suit your individual off-road riding style. LOW PRESSURE TIRES: Argo tires are custom engineered to provide propulsion for the vehicle when used amphibiously and to provide superior traction when off-roading in challenging terrain. Chains drive machined sprockets. 1 1/4 in. diameter axles with triple sealed greaseable outer bearings. LCD digital gauge cluster: speedometer, odometer, voltmeter, hour meter, tachometer, low oil pressure, parking brake reminder lights and check engine light. See through polyethylene fuel tank. 8 hours of operation. Belt-driven, Continuously Variable Transmission (CVT) maximizes engine power to the transmission. One-piece ergonomic handlebar steering control with mounted brake lever. For safety and ease of handling, the ARGO steering transmission provides continuous torque to all axles. Formed steel channel frame, welded for high strength and durability. Protected with Bonderite® epoxy-acrylic base coat, textured black epoxy top coat. Vacuum formed High Molecular Weight Polyethylene (HMWPE) on-piece lower body.